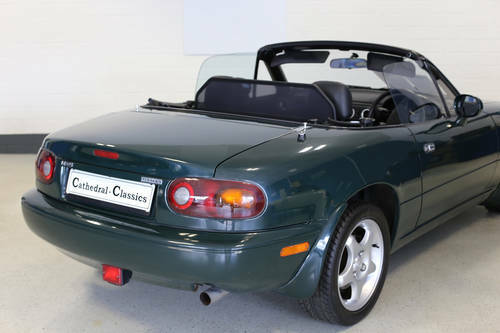 Charming Mazda MX5 1.8i with full documented Mazda history. 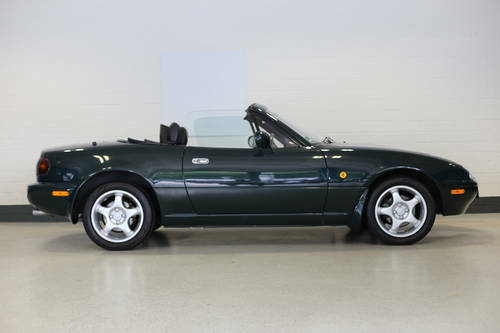 EXTERIOR - Finished in British racing Green, Mazda code (HU), this charming example now shows signs of new paint required on the bonnet. 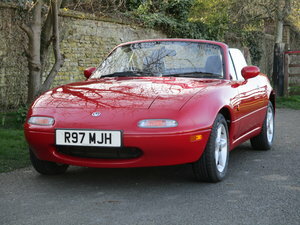 It has recently benefited from new paint on both sills and boot but, does not detract from this charming cars appeal. 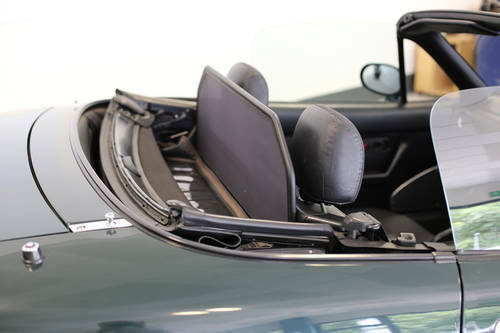 The incredibly well engineered soft top was renewed in 2011 and has since been garaged. 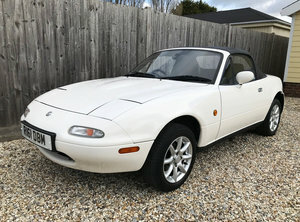 Ridiculously easy to remove from inside the car in comparison to other marques from its period, it’s a tribute to Mazda just how advanced this car was for its time. 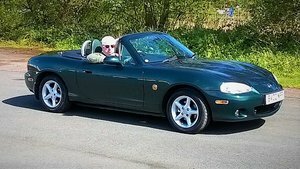 Unzipping the rear window gives a delightful alternative to full open top driving. 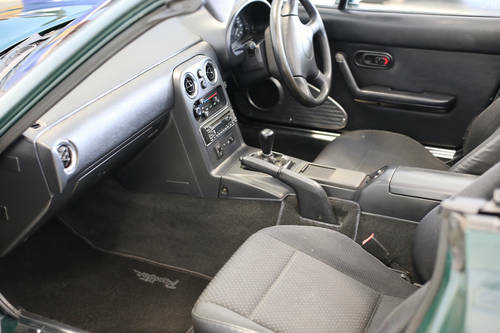 INTERIOR - The cloth interior with vinyl backing is in fine condition. Additional aluminium entry sill and door speaker housing offer a nice effect to a typical period feel. 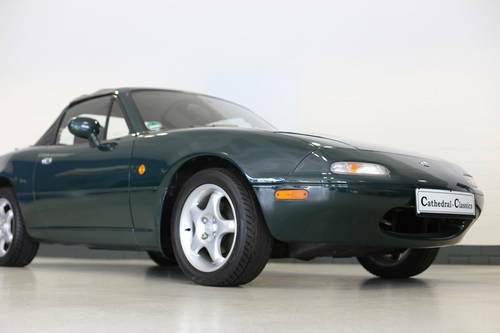 ENGINE & TRANSMISSION - The 1.8i in line 4 cylinder engine produces 133 bhp (99kW) at 6500 rpm with 5 forward gears. 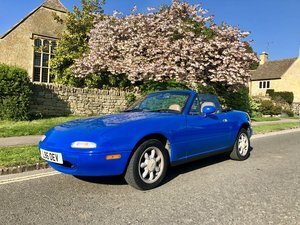 Gear shift is crisp and again, shows just how far ahead Mazda were in terms of technology when producing these cars in a time of dying sports cars. 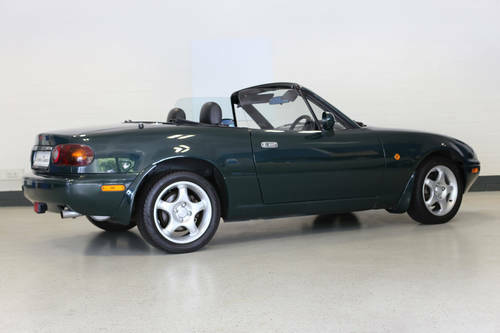 Launched when general production of small roadsters from competitor manufacturers had almost come to an end, Mazda were about to conquer the sports car world with the ubiquitous MX5.